In 1920 this port employers' association (SVZ) elected to have its own office building designed. 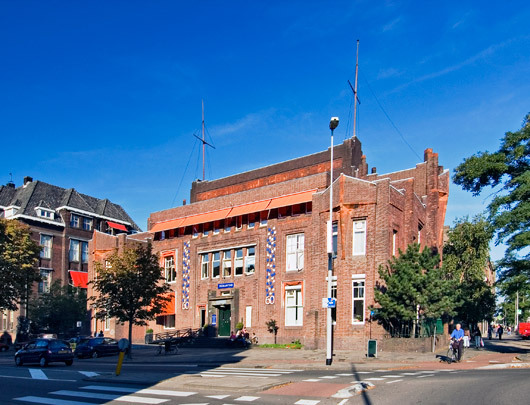 Architect Willem Kromhout laced it with references to the world of shipping including two masts and something resembling a ship's bridge on the roof and prow-shaped bay windows - hence its popular name 'the brick boat'. The monumental entrance leads to a central hall with an equally monumental stair. Offices occupied the two side bays; somewhat tucked away at the rear is a large meeting room whose roof light is decorated with an abstract pattern in leaded glass. Plaster, fair-faced brick and timber wainscoting obtain in the interior as a whole. The building was taken over by the Humanitas charity organization in 1987. Kromhout also designed the building for Printworks Wyt en Zonen across the street.